Read all about the fantastic learning that is happening in our classes. Following our super space investigation morning, we enjoyed tasting the left over planets (apples, limes, blueberries, raspberries, watermelon, and oranges), which were all delicious. Lots of us tasted watermelon for the first time and really enjoyed it. The lime tasting resulted in some very funny faces. Well done to everyone who was brave and tried something new. Who would have thought the solar system could be so tasty? What a fantastic morning in Class 7! We had a wonderful morning creating our own fruity model of the solar system on the playground today. We know our solar system is millions of kilometres wide but we used a scale model using 1 cm to represent 1 million km and a second model using 1 metre to represent 1 million km. We liked the smaller scale model because we could see all of the planets and the relationship between them more clearly but the larger scale was impressive and great fun to make. We used a range of measuring equipment and our earlier research on the planet's diameters to select the best fruit to use. It was easy to decide Jupiter should be the melon. Unfortunately, there was nothing we could think of that could represent the sun (with a huge 1.4 million km diameter) so we chose a point in the playground to accurately measure from. So incredibly proud of Class 7 this week. They did an amazing job with their assembly on Wednesday. Well done everyone for their confidence and wonderful team work skills. Class 7's learning morning was a great success. Thank you to all of our parents and carers who could join us for our maths lesson. I'm sure all of our visitors were impressed with our speedy times tables recall and we loved showing off our fraction and decimal conversion skills. Learning morning in Class 6 was great fun. Thank you to all of our parents and carers who could join us . We all did a great job working together to order and compare improper fractions and mixed numbers using number lines. It's taken a few weeks but we have finally finished making our moving mechanisms. It wasn't easy at first as we had to measure, cut and glue our base together and then design and make our cover and moving part. We thoroughly enjoyed this experience and we will be showing all of them at our celebration assembly on the 3rd of April. Here are just a few of them. Comic Relief fun in Class 7 today. Great job everyone, I think the noses really suited you! Over the last few weeks, Class 6 have been working incredibly hard to put together our own Dragonologies Book! We can now tell you that it has finally been completed!!! To create this wonderful book, we have each written our own Dragon Non-Chronological report on a specific dragon that we have created. In the book you will find a range of interesting and mythical dragons. To put it together, Mrs Gollick (with the help of some members of the class) stuck the pages together with a front cover to create a book we can enjoy as a class. In order to support Red Nose Day last Friday, Class 6 dressed in red and wore their array of red noses. Their red noses also kept them company during the day on their desks as we soon discovered it was quite tricky to get work done whilst wearing them. Great effort Class 6! In Class 5, we have been practising our Spanish greetings. We like to sing a song at the beginning of our Spanish lessons. We hope you like our lovely singing! A systematic and logical approach was needed for our reasoning problem today. Class 7 showed great persevering skills, teamwork and resilience when tackling our tea cup challenge in maths. Everyone was very proud of their success! We loved sharing our books on World Book Day. Take at look at some of our favourites and check out our reading display to see what we love to read in Class 7. We learnt how to use the 2Design and Make tool in the Purple Mash I.C.T programme. We explored the different viewpoints in 2Design and Make whilst designing a different building and a vehicle. We looked at the effect of moving points of the net when designing, to alter the shape of the buildings and vehicles. Following this we discussed what we would like to design and make for a purpose and we agreed on an Easter box. What a delight for Class 7 to be the first class to discover a treasure trove of new books on display in our fantastic library. We were very excited: many of us found just the book we were hoping for! Take a look at an example of some art work from Class 8. We will be eventually sketching and painting a self portrait but as a practise, we sketched Henry VIII. We had to grid the photo in order to really focus on the size and proportion of every part of the portrait and we tried extremely hard. These super star readers have been enjoying reading at home and have cashed in some of their reading points for fabulous prizes in our library today. We really enjoyed sharing books in our library time this afternoon. Thank you to to all the children who helped look after the space by tidying the shelves and scanning books for their friends on the computer. We had a very exciting class council meeting today: our school council representatives asked us to suggest questions that they could ask the Mayor in their up and coming Town Council visit. Class 5 have been dividing practically by using cubes and partitioning into tens and units. Check out this young man's comic book that he has made in his own time. It is so good we have put it in Class 6's Reading Corner! Amazing team work in Class 7 today when we were building sentences with subordinating clauses. We know how to vary the position of the subordinate clauses in our sentences and we know when to use commas. Great work everyone! What talented teachers we have in Class 7. These super stars took over teaching maths. I think I may need to watch out: they were really good! Check out Class 6's reorganisation of a non-chronological report all about space. The children had to decide where each section should go so that it was accessible to the reader. 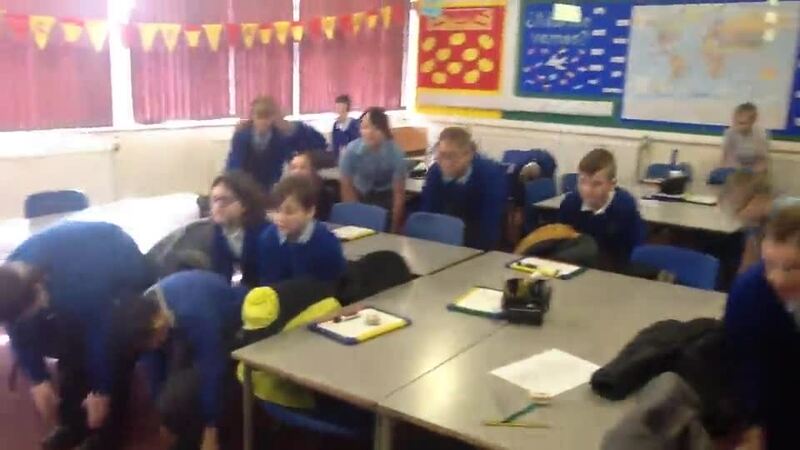 These children are on this week's leader board for Class 6's Beat The Teacher multiplication challenge! Some of them even answered all 100 questions in under 5 minutes. Well done! Class 6, 7 and 8 had a fantastic Christmas Party on Tuesday. Everyone had such a good time. Check out some of our amazing outfits and dance moves. Take a look at this fantastic construction! This super star builder made this at home and it even has doors, windows and supports in the roof. What fantastic athletes we have in years 5 and 6! We had a fabulous athletics tournament with Team Active yesterday. Well done to all of the children who took park and showed their talents and great sportsmanship. We wish the two winning teams good luck in the final. We have worked so hard learning long multiplication this week. Everyone has been eager to improve and practise their skills. We applied this learning in our dicey operations game today where we had to challenge a friend to get a product that was closest to 100,000 by multiplying a 4 digit number by a 2 digit number. Such multiplication fun! Class 7 have been investigating square, prime and cube numbers this week. We used multi-link to help us build cube numbers and we were very surprised by how many we would need. Can you add together any prime numbers to total square numbers- we can! We have demonstrated fantastic reasoning and team work skills - well done everyone. Last week we all enjoyed our learning mornings where parents are invited to take part in the child's learning. This has been a huge success across school, with a great deal of learning taking place for both children and adults. In Year 6 we held a creative learning session where groups of children and parents worked together, showing fantastic teamwork, to build the strongest bridge possible using a limited range of resources. A great deal of fun was had by all! All this really made us think about what to do in these situations if it happened in real life. We had a great day and again our behaviour was brilliant. Class 7 have been learning all about light in science. We know light travels in straight lines from a light source and we have investigated reflecting light using mirrors to alter the angle of reflection. We had a fantastic time this week making periscopes. We worked together to measure accurately and had to persevere when keeping the angles of the mirrors equal so the image would be reflected correctly. We were very excited when they worked and we tested them out by spying around our classroom! This term, Key Stage 2 are learning all about WW2 so we decided to go to Eden Camp. Take a look at year 5 and 6 and all the amazing things we saw. We all had such a fantastic day and all the children were so well behaved (as always). This week we have been using place value counters and cubes to understand the exchange of tens in column addition. The children enjoyed the activity and by the end they had a great understanding of the method. Last week we went to Eden Camp to learn more about WW11 to support our Topic. We had a fantastic time and the children were really interested and well behaved. We have been practising quick mental addition using number bonds, doubles, near doubles, partitioning and rounding skills to help us. We need to keep thinking about known facts that can help us but we are definitely getting quicker! Class 7 enjoyed some time in the library this week. We are loving reading our class book - Carrie's War. We really enjoyed being code breakers this afternoon. We used our Caeser shift wheels to crack codes from WW2. It was tricky to find the correct position of the wheel at first but we cracked it! We really enjoyed investigating Roman numerals in class 7 today. We found some numbers (especially 40 and 400) tricky at first, but with a positive attitude and super team work we succeeded. Great work from class 7 researching events in WW2. We found out lots about the different countries who joined the war effort and placed significant events from WW2 on a timeline. We have also enjoyed reading a diary written about the blitz and discussed how difficult it would have been to lose our homes. Even though times must have been so difficult, people wrote about the solidarity and determination shown by the British people during this time. Welcome back everyone, what a marvellous day in class 7! We have had lots of lovely listening and hard work, tons of kind and polite attitudes and superb team work skills shown in our class today- keep it up everyone! We really enjoyed our place value work in maths, where we had to think about representing numbers in different ways, we even discovered some representations we had never thought of before. Well done to the winning team with 11 different ways of showing one number! This afternoon in Class 7, we tried to imagine what it would have felt like to be in WW2 when an air raid siren went off. Unexpectedly, the air raid siren came on and we quickly got into our shelters (underneath our tables). We listened to Neville Chamberlain's speech announcing the start of the war and discussed what it must have felt like for children during this time. We were squashed and quite confused at first. Then we imagined what a real bomb shelter would have felt like if we had to stay there for hours during the day or night. We have loved our pentomino challenges in Class 7 this week. Today we arranged the full set of 12 pentominoes to enclose a 'field' with the greatest area possible. Everyone showed fantastic resilience when they needed to change their designs (quite a lot) to ensure a full edge was touching and there were no gaps! Take a look at the super stars who managed to create a field containing over 100 squares. After writing our incredible Forest Schools letters, Class 5 have been putting the woodland to good use by building some lovely summer homes for the local Elf community. Everyone was extremely creative and worked incredibly well as part of a building team. Class 5 and 6 have been very busy in our Scrap Shed creating some incredible Viking Longboats. It was a lovely afternoon of creating fabulous prows and even adding extra details like shields to our designs. Our Vikings are definitely ready to set sail. Class 7 showed fantastic persevering skills when investigating pentominoes today. There were some tricky problems but were determined to work together and solve them. The day the Vikings came to school. Year 5 and 6 were fantastic in the NSPCC workshop today. We learnt a lot about keeping ourselves safe and how and where to get help if we need it. Well done for your super listening and discussion skills everyone. We have been extremely busy practising for our times table battle of the bands! We really want to win. Fantastic team work in Class 7 today when we were calculating missing angles on straight line. Some of the reasoning problems with more than one missing angle really got us thinking. In class 7, we have really enjoyed learning all about angles this week. We are good at naming angles and have improved our protractor skills. We are still finding estimating tricky (especially reflex angles). Why not try some games at home to practise your estimating skills? 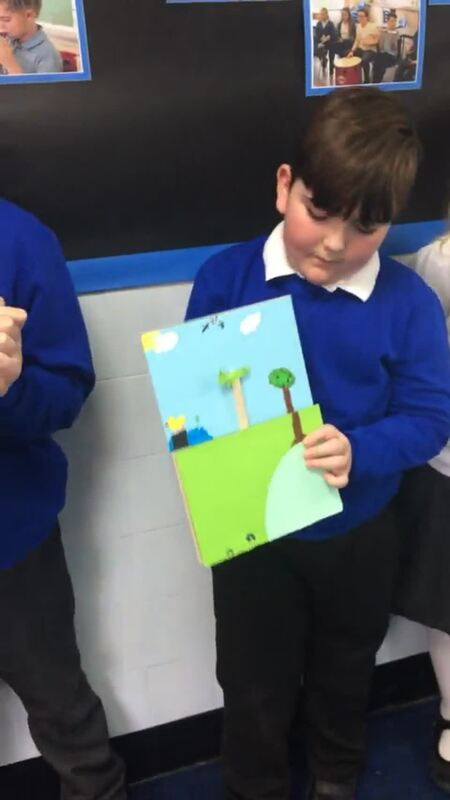 We really enjoyed learning about adaptation and explored how different species of animals have special features that enable then to survive in their own unique habitats. We created our own creatures using plastercine and adapted them for various different environments and tasks. Class 7 had a fabulous time designing and making headdresses. We were inspired by our studies of Ancient Greek myths and legends and we used a range of techniques and combined a variety of materials to depict our chosen god, goddess or creature. Class 5 have been working incredibly hard in P.E. Team Activ are back to help us improve our Rugby skills...Definitely a few tries scored in today's lesson! Everyone in Key Stage Two worked incredibly hard during Arts Week. The dancers have been learning six fabulous, new routines that I'm sure will impress everyone! Keep your eyes peeled for more fantastic dancers...Oh what a night it will be! KS2 are learning about how to present information using Purple Mash 2 Connect in I.C.T. They are learning about using nodes to present information about the Vikings. Here are a few photos of class 6 in action. The seeds have been planted ready to grow into the vegetables that will make this years soup. On Wednesday classes 7 and 8 had a visitor. Darren England, who is a professional referee, gave an interactive presentation about the skills and role of a referee. 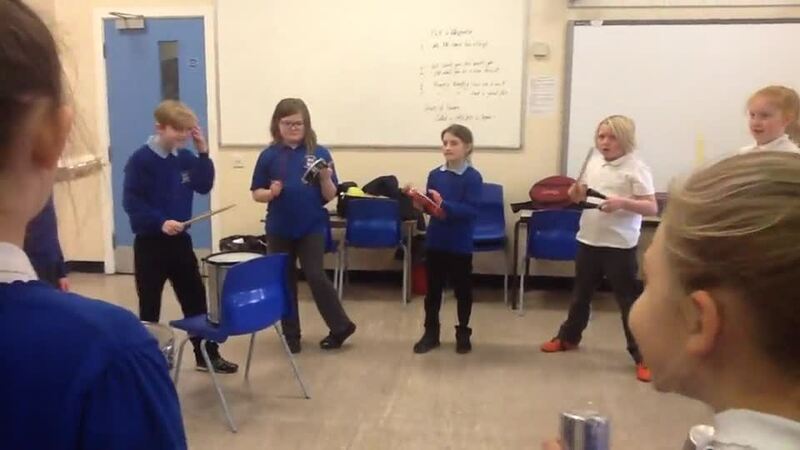 During the session, the children had to create or improve a piece of equipment for a referee to use and present their invention to the class, like Dragon's Den. We all found out lots about the game that we didn't know about. The gardening season has begun! Class 7 went out today to weed their raised bed in preparation for planning their seeds later in the week. Shakespearean News just in - King Duncan Discovered Dead! Watch this space for our reports on the dreadful murder at Dunsinane Castle. Roving reporters in Class 7 have scoured First News (a newspaper for young people) for phrases and words they can magpie for their own newspaper reports. Class 7 have shown fantastic team work and resilience in their maths learning this week. A big well done to everyone for super persevering and use of resources to convert improper fractions and mixed numbers. Class 7 are loving our Macbeth work in English. We have read extracts from the play and compared it to a modern day version of the story. After watching animated tales of the play, we thoroughly enjoyed getting into character with our freeze frames and drama work. Class 7 have taken inspiration from Greek Myths to create wonderful headdresses. We have combined a range of materials to represent different gods, goddesses and creatures from the stories we have enjoyed. Would you like to see the egg-straordinary eggs that we have designed and made? They are egg-ceptionally good. Chocolate crispy buns were a delicious treat for Class 7 to end the term with. Hope you all have a restful and happy Easter break. Can you sing in Spanish? We can! Listen to our amazing percussion playing. We would like to say an enormous thank you to all the parents and grandparents who came to join us for our learning afternoon. It was fantastic to share our learning with you. Class 6 have been developing their drama skills. They have been creating freeze frames from the story The Wolves in the a Walls by Neil Gaiman. They have been using thought tracking to decide what the characters might be thinking. They were so good that the audience could work out which parts of the story they were portraying. We have been learning how to attach pieces of clay using cross hatching and slip. In Class 5, we have been finishing off our epic Greek Theatre masks...we've had lots of comedy and the children have created some incredible designs based upon a Greek God or Goddess of their own choosing. They have worked incredibly hard on these designs and it shows in the quality of their work. Well done Class 5! Excellent collaboration when building complex sentences in Class 7 this week. We rearranged the word order to include subordinate clauses at the beginning and the end of the sentences. In Class 7 we have really enjoyed sewing our parabolic curves. We think they make fabulous calendars and we're very proud of our finished designs. Class 5 have been working extremely hard in the week up to Christmas creating some beautiful snow globe calendars with themselves trapped inside. We all thought it would be lots of fun being stuck inside a snow globe! Our class has also made some super snowmen Christmas cards for their lovely families. What a fantastic term we have had in Class 5! Can't wait to see what we achieve in 2018. Take a look at our trip to Crucial Crew. 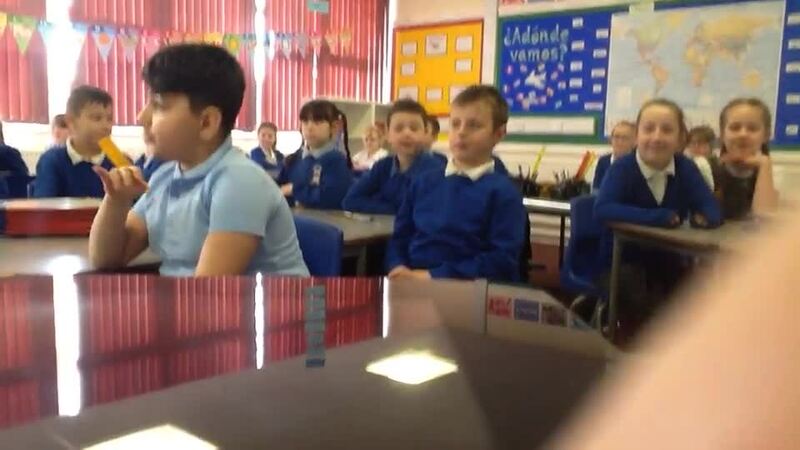 All the Y6 children travelled to Rotherham and when we arrived, we were split into two groups. Throughout the day, the children were put in different scenarios which involved: a court room, internet safety, road safety, travelling on public transport and what to do in a house fire. The day was fantastic and the Y6 children learnt so much in terms of how to keep themselves and others safe. Take a look at class 8 preparing their pasta salad. It was delicious! Class 5 had to complete the triangle tower task. They had two pieces of paper (one was for the base and one was for the tower). They could only use triangles to build the tower and it had be free standing. It was a tricky task so they had to be resilient and they also had to co-operate and compromise. We would like to say an enormous thank you to all of those parents who came to join us in our maths learning morning today. It was fantastic to see you. The children love to show you what they are learning and just how good they are at maths. We were using all our maths skills to work out the price of holidays, our shoe sizes and ages. Year 5 children have been learning to play percussion instruments every week. Their skills are improving every week (and they love it). In maths, Class 5 have explored the fascinating world of Roman Numerals. We worked as a whole class to create a clock using only roman numerals. Did you know roman numerals were carved in stone? This is why all of the numerals have straight edges so that they are easier to carve. We have had so much fun and the children really enjoyed our practical lesson about making these numbers. What brilliant numbers they are! In Class 5 we have been using our scientist skills to look at the components of blood within the human circulatory system. In groups, we made blood using different equipment to better understand the cells within the blood. Red blood cells, plasma, platelets and white blood cells really are incredible. What fun we had! Miss Stanley's maths set have been learning to order fractions. In order to do this, we have found it easier to convert fractions in to decimals and then order them. We played the game three in a row and we really enjoyed playing it. Here are some photos to show off our amazing learning. Class 7 thoroughly enjoyed making 'blood' yesterday. We used: pineapple juice, marshmallows, strawberries and sprinkles to represent the four components of our blood. We learnt that most of our blood (55%) is made up of plasma, which is mostly water but also contains nutrients, hormones and proteins. We also found fascinating blood facts to record in our topic books. Did you know 2-3 million red blood cells are made every second in the bone-marrow? Pester Power- Class Four have been learning about the 'Art of Persuasion' in Literacy. After an exhausting PE session learning new football skills Class 7 were able to relax and enjoy reading a book in the library. All of our hard work planting and tending our vegetable patch has paid off! Class 6 have visited our school library for the first time this term. GETTING HOOKED ON A BOOK IS BRILLIANT. In PE we are learning loads of new football skills with Mr Gorner. This week we have been practicing our turns.